Most car stereos often have a slot for CD, SD card and a USB slot. Normal CD files are encoded in a file type called .wav. With these file types, it means that your Mp3 files are not compatible with your car stereo. An mp3 decoder is used to interpret mp3 files in the car stereo. If you have a computer you can easily convert your existing CD files to mp3 and store them in a flash disk. With the help of your mp3 decoder, you can now enjoy listening to your mp3 songs as you drive. In some cars, you will need to convert the AAC port into an mp3 decoder. Most of the car’s surround systems come with a USB port but some old versions lack this port. It can be frustrating if you have a dope music collection and you cannot enjoy it due to lack of a USB port. Investing in a new car stereo is costly but there are alternatives. To add a USB port to your car stereo locate the FM transmitter. Most of the FM transmitters have the ability to read USB files. However, the sound quality is not that great. This is because the FM transmitter is congested with signals. If you want to improve the sound quality the other best option is to get an FM modulator. Once you have it in place you will need to add the software to play the mp3 files. Playing music from the USB port is a simple plug and play method. If you experience problems with playing your mp3 files then the problem could be how your head unit converts and reads the files. Music files vary and include mp3, ocg, Apples AAC, ALAC or FLAC. The latter two are high-resolution files. The problem arises when your stereo is unable to read your music files. In this instance, you will need to check your car’s stereo manual for files that it can read and convert the music files through your computer. If your car stereo still does not play your music files the problem could be how your USB was formatted. The USB could be looking for a FAT32 system while you have NTFS. A simple format in the right way can solve the problem. You may also be required your file directory if you notice the car stereo is taking time playing songs. 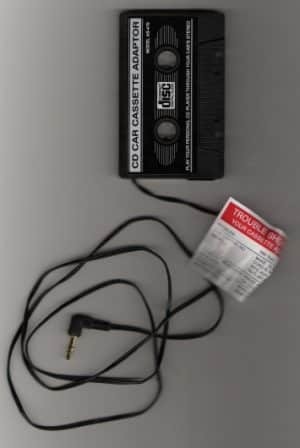 If you do not have a USB connection you can use the cassette player adaptor. Cassette players are no longer used so do not feel guilty converting your player to mp3. The cassette player adaptor resembles a normal cassette but with a few modifications. In this instance plug, the adaptor earphone jack to your mp3 player and the other end inserted in the cassette player slot. Your mp3 files will know play through your car stereo. Most of the car stereos come with Bluetooth as standard. Bluetooth enables you to connect your iPhone or Android phone with your car stereo. It also enables you to make and receive calls while driving. Old car models may lack Bluetooth connectivity but the problem can be solved by installing a Bluetooth adaptor. With the adaptor, you can now listen to your songs comfortably. Modern car stereos now enable you to directly connect your mp3 player through the audio jack. You can identify the jack on the glove or stereo jack. In some car models, the audio jack can use an RCA/audio cable, USB cable and in some instances have both. Advanced stereo will even give you the ability to navigate the mp3 player through the stereo buttons. In this scenario, you use the line-in jack to connect to your mp3 player. The 3.5mm head jack will connect in a male-male cable and this lets you listen to your mp3 files on the car stereo. It is vital that you research carefully on car stereos before purchasing one. A good car stereo produces superior sound quality and comes armed with various features like CD/DVD, AM/FM tuner, MP3, USB port and satellite radio. You should also get a stereo that lets you adjust various preamp settings like volume, fader and tone selections. Higher end models come an amplifier boosts your sounds. This is one of the most important features in a car stereo. You want to enjoy listening to your music files without interference. With the preamp controls, you can adjust the sound settings for more clarity. The better the sound quality the more you pay for the stereo. It is our recommendations that you go for reputable brands like Pioneer or Kenwood when purchasing a car stereo. Ensure that what you are purchasing comes with a warranty. Test the equipment before driving off. The more options you have the better the sound. Advanced stereo capabilities enable you to playback MP3/AAC/WMA. Other features to look out for include support for Android and iPhones, DVD playback, satellite stereo, GPS navigation, Bluetooth connectivity, and support for multiple apps. A touchscreen monitor is a cool way to access the stereo features. Modern stereos now come with digital time corrections and this enables precision sound control. For the higher-end models, you will also have parametric equalizations. The touchscreen can be full color and your budget will determine the size of the display. High-end models enable you to play DVD with some have flashing lights that go with the beat of the song. A detachable face is an added feature as it protects your car stereo from theft. Advancement in technology has rendered the typical cassette player obsolete. Mp3 music files are the most common way of listening to your favourite tracks. Modern car stereos come with USB ports or Bluetooth connectivity. You can still listen to mp3 through an old stereo by doing some modifications like getting a cassette adaptor, using a jack 3.5mm end to end cable and installing a Bluetooth adaptor.